I've read Crystal's books for years, romances under both of her names, and she knows how to create an atmosphere that draws you into the story. I was drawn to The Look of Love for its setting (Virginia, where I live) and the premise of a "macho" man who hasn't forgotten his roots. 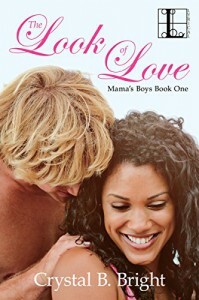 In this first of a trilogy, MMA fighter Gunnar has come home to help his mother run her hair salon. Sounds easy, but there's baggage - namely the girl he left behind in order to achieve stardom. Gunnar and Eboni are a great couple, fighting romantic tension and sparring over his mother's well-being. I look forward to the other two books and hope to see more of the supporting players who add to the setting.